With Lucifer doing terrific business at the box office and making records, all eyes are on Mohanlal's biggest competitor at box office, Mammootty, do challenge him with his Madhura Raja. A Vishu treat for his fans, Madhura Raja is the sequel to one of Mammootty's biggest blockbusters, Pokkiri Raja. Vyshakh, who has directed the first film, returns for Raja's second innings that promises to be an entertaining ride of masala, action and humour. We are watching Madhura Raja right now and here's what we have to say about the first half. 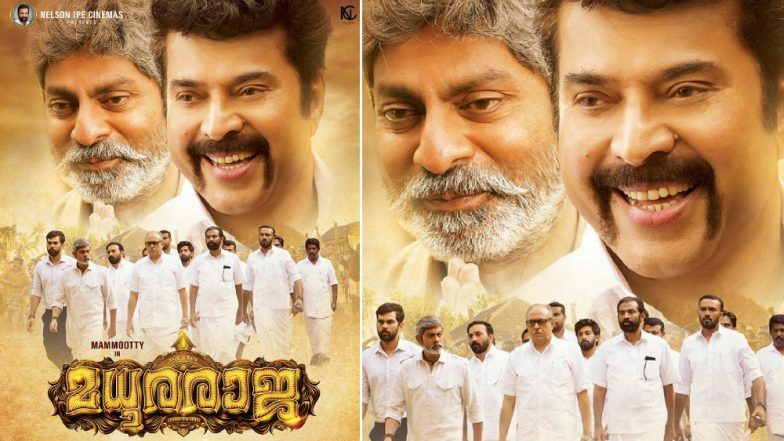 Madura Raja New Poster: Mammootty Is Back in His Unbeatable Style! "Madhura Raja brings Raja and his cronies to a new adventure and face a new villain. This time, he is protecting his father who has gone to a hamlet in Vyppin to check out the illegal activities of a liquor baron there. It takes some time for Mammootty to make an entry in the film. Almost half an hour is spent in setting the premise, which is just old wine in a new bottle, and the film's assorted supporting characters. Madhura Raja gets a fresh lease of life when. Mammootty enters the scene and makes the film a fun watch from thereon, with his screen presence and broken English. Madhura Raja Trailer: Mammooty’s Mass Role and Sunny Leone’s Glam Appearance Are the Highlights – Watch Video. Prithviraj, who was the other male lead in Pokkiri Raja, doesn't return for the sequel with a very meta reason given for the same. Filling his empty space is Tamil star Jai, making his Malayalam debut. His romance with Mahima Nambiar also hogs up much screentime in the first half. Overall, the first half is over-long but makes for an entertaining watch mostly because of the man, Mammootty, himself. The interval point comes with a message 'The Real Play Begins', making us wonder why the makers would spend nearly one and a half hour before just for warm-up."